Winter has fallen upon us, and the 2018 Winter Court has passed. In the wake of the gathering of the champions from each of the Great Clans, the Imperial Court has seen fit to alter some of the laws of the land for the coming year, and the Imperial heralds are now dispatched to inform the Empire. There's a lot going on in the latest update to the Legend of the Five Rings: The Card Game Rules Reference (pdf, 4.6 MB), so I would like to provide explanations for some of them. The first and most significant change comes from what we can look forward to—the Children of the Empire Premium Expansion is coming. In order to properly integrate the new cards in that expansion, we are making several minor updates to the rules. As such, you will find the rules entries for Duels and Keywords updated, as well as new entries provided to explain the new Composure keyword and what happens when a character is copied. These are not functional changes so much as new entries to cover new abilities that will soon be introduced to the game. The current terminology for duels, using the word “challenge,” continues to work the same as it has done. Previous versions of the rules did not explicitly cover all the restrictions involved in playing characters from your provinces. This led to some confusion with regards to Back-Alley Hideaway (Into the Forbidden City, 47), which instructs players to play a facedown character as if it were in a province. A developer ruling indicated that the character could be played in any Action window, but every other instance of playing characters from provinces can only be done during the dynasty phase. The entry for Characters in this version of the Rules Reference has been updated to clarify that characters can only be played from provinces during the dynasty phase, and characters cannot be played from hand during the dynasty phase. This changes the functionality of Back-Alley Hideaway so that the facedown character can only be played during the dynasty phase. In the past, the combination of Togashi Yokuni (Core Set, 65) and Adept of Shadows (Core Set, 180) allowed a dynasty card to enter a player’s hand of conflict cards. As the use of dice could still allow a player to randomly select a card from their opponent’s hand—despite the fact that the cards would have different card backs—this was allowed. Now that Karmic Balance (Children of the Empire, 60) will soon allow players to shuffle Togashi Yokuni into their conflict deck (if he is returned to hand), the rules have changed regarding what happens when a card enters a hidden zone of the opposite deck type. 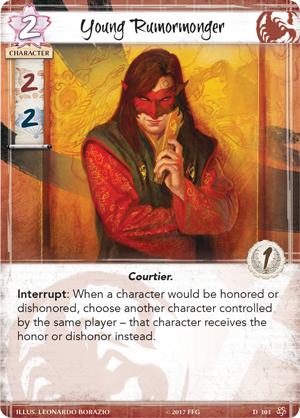 If a dynasty card enters a player’s hand of conflict cards, it is discarded instead. 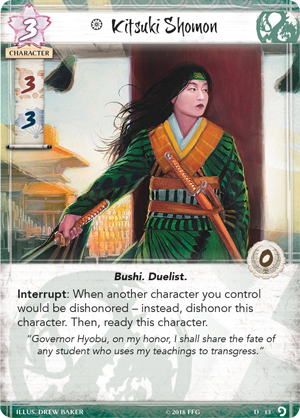 If a dynasty card would enter a player’s conflict deck, it is discarded instead. If a conflict card would enter a player’s dynasty deck, it is discarded instead. The interaction of replacement effects and conditional “then” effects has been highlighted recently by cards such as Kitsuki Shomon (Underhand of the Emperor, 13) and Young Rumormonger (Core Set, 101). To clarify how replacement effects work in general, two additions have been made to the entry on Replacement Effects: one clarifies that a replaced triggering condition is only considered to be fulfilled for the purposes of paying costs (and explicitly not “sacrifice” costs), and the other clarifies that you cannot initiate a replacement effect that would not change the game state. For example, Kitsuki Shomon cannot trigger her ability to move a dishonor status token to herself if she is already dishonored, as the pre-“then” triggering condition that her ability creates would not change the game state. If she was not dishonored and did trigger her ability, and Young Rumormonger replaced her replacement effect by moving the dishonor to a different character, the triggering condition in which she would become dishonored was not fulfilled, and she will not ready. Until now, it was unclear whether a character with no attachments could be chosen as the target of the ability of Frostbitten Crossing (For Honor and Glory, 21). The rules state that “a card is not an eligible target for an ability if the resolution of that ability’s effect could not affect the target at all.” However, Frostbitten Crossing does not interact with its target directly, and technically never affects it. This update to the Targeting rules introduces the term "referential target" to refer to a target that is not directly affected by an ability, but that is chosen as a reference point for the ability's resolution. It then clarifies that you cannot choose a referential target for an ability if the ability's resolution would not result in a change in game state—so you cannot choose a character with no attachments for Frostbitten Crossing’s ability. A small number of cards in the Elemental Cycle had text that, while intuitive, did not technically work as intended within the rules. This update provides errata to make four cards function as intended: Oracle of Stone (Tainted Lands, 37), Ikebana Artisan (The Ebb and Flow, 63), Hidden Moon Dojo (The Ebb and Flow, 68), and Mantra of Earth (Elements Unbound, 116). This version of the Rules Reference represents the second major update to the Restricted List. Because a number of cards were added—and two were removed—I will briefly explain why these cards were chosen. Feast or Famine (Into the Forbidden City, 41) is one of the most powerful cards in the game, and it is neutral. What kept it from being ubiquitous in every deck was the fact that only clans with a Fire role could take it, so only two or three clans could have it at any given time. With the new Role selection process that will occur during next year's Elemental Championships, that limitation goes away, as every clan has the ability to get a Fire role if enough members of that clan vote for it. Even with Feast or Famine on the Restricted List, there are other powerful Fire cards in the card pool that we anticipate will encourage clans to pursue a Fire role, and some players will still want to choose Feast or Famine over other restricted cards simply due to its power level. As a result, Feast or Famine is restricted to balance the appeal of the Fire role against those of other roles, but without entirely taking away one of the role's biggest draws. When Iron Mine (Meditations on the Ephemeral, 103) was put on the Restricted List, it was done so to take away some of the Crab Clan’s ability to keep characters on the table indefinitely, especially when combined with Charge! (Core Set, 210). 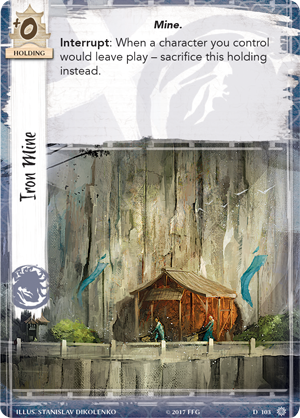 There were many reasons that Iron Mine was more powerful than Reprieve (Core Set, 132), the other obvious choice, but a major element of that was Rebuild (Core Set, 136), which could allow Iron Mine to enter play for free at the end of the conflict phase. However, Rebuild offers players much more than just its interaction with Iron Mine, and the ability of this free event to supply Crab players with an effective toolbox of holdings has already begun to prove effective. As this flexibility will only expand as the card pool grows, Rebuild is being restricted in Iron Mine’s stead. At the 2018 Winter Court World Championships, the Crane were the clan that advanced the most players to the Day 2 single elimination event, and their champion claimed the ultimate victory as Erik Baalhuis was named Shogun. 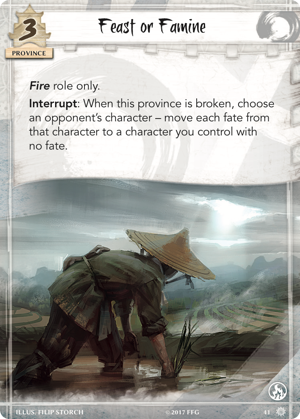 As the Crane have proven to be highly effective and have not so far had any cards added to the Restricted List, we are restricting Guest of Honor (Core Set, 51) to give Crane players an additional choice during deckbuilding and to maintain balance with the other clans as they face the addition of new cards to the Restricted List. In the leadup to the 2018 Winter Court World Championships, the Dragon and Scorpion Clans were perceived to be the strongest in the game. In many ways, this perception was also reflected in the tournament's results, as the Dragon and Scorpion were the only two clans with more than one player represented in the Top 8. Dragon’s access to powerful cards is not limited by deck archetype—the early-game potency of Niten Master (Core Set, 64) allows them to get ahead in the early part of the game, while powerful Monk cards fueled by Togashi Mitsu (All and Nothing, 86) allow them to stay ahead in the later part of the game. Importantly, Dragon decks are not broken up by deck archetype. 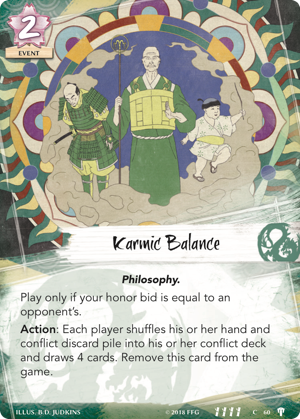 Because of the synergy between Mountain’s Anvil Castle (Core Set, 3) and attachments such as Seal of the Dragon (Meditations on the Ephemeral, 114) and Fine Katana (Core Set, 200), the more Weapons-focused attachment deck can also use all of the powerful payoffs—Sacred Sanctuary (Breath of the Kami, 2) and Void Fist (All and Nothing, 94)—for the Monk-focused event deck. In order to break up these decks, we have chosen to restrict the two most powerful payoffs of each deck so they cannot be run together: Niten Master and Void Fist. Phoenix is a powerful clan, but its power comes from the combination of effects rather than single haymakers… with Isawa Tadaka (Disciples of the Void, 10) as the exception. 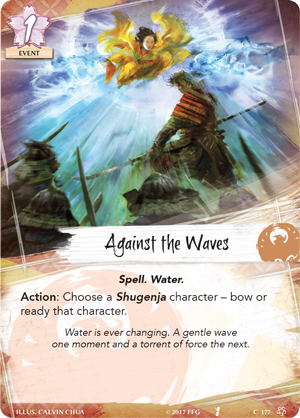 When Against the Waves (Core Set, 177) was initially restricted, it was because Kyūden Isawa (Disciples of the Void, 1) allowed players to play this potent readying event up to six times in a single game. However, it took the card away from other clans, who may want to play Against the Waves with their own shugenja. By restricting Isawa Tadaka in place of Against the Waves, we retain the viability of the Phoenix Clan's Kyūden Isawa decks, while other clans will now have more reason to consider playing Against the Waves. 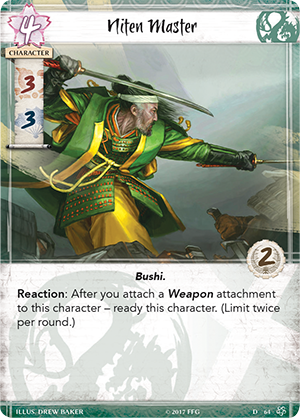 The Scorpion Clan was easily the dominant clan throughout most of the Toshi Ranbo Kotei Series and was potent enough at the 2018 Winter Court World Championships to elevate two players to the Top 8, with one competing in the finals. 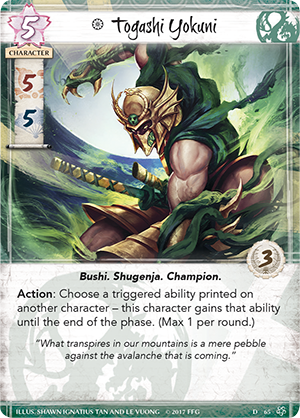 The clan's persistence at the top of the tournament scene and the ongoing success of its strategies prompted us to introduce a measure of the change that flows through all of Legend of the Five Rings: The Card Game, and we elected to balance the Scorpion against the other clans by restricting two of their cards. A Fate Worse than Death (Fate Has No Secrets, 98) is one of the strongest tools available to the Scorpion, and it allows them to reactively control the game. 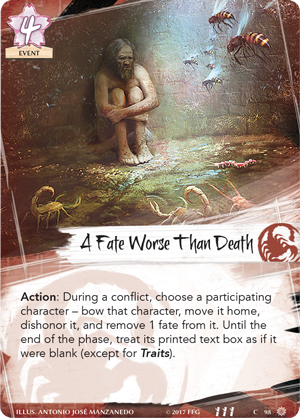 While the card is fairly costed at four fate, its existence allows Scorpion players to lean into their reactive nature, using A Fate Worse than Death to shut down powerful attacks if necessary and playing out powerful conflict characters such as Bayushi Kachiko (Into the Forbidden City, 56) if not. 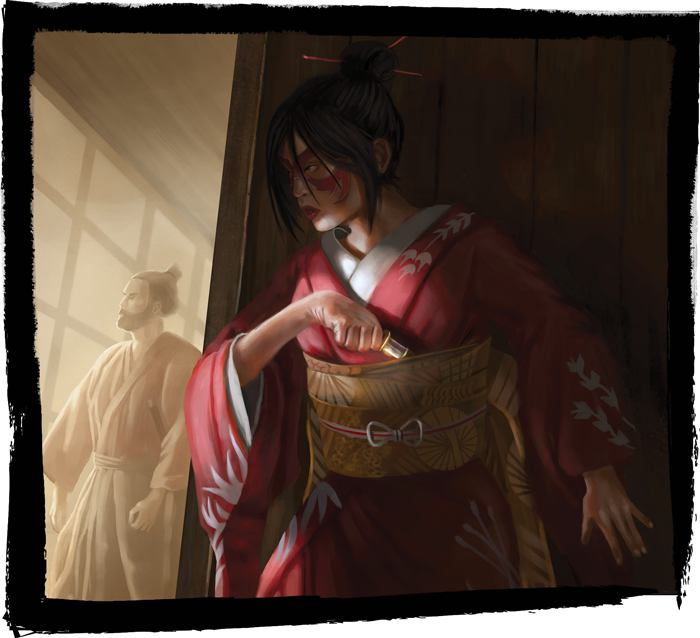 Restricting this card will apply an additional opportunity cost to running the staple cards of the Scorpion clan. Young Rumormonger was restricted due to its ability to shore up the Scorpion Clan's weaknesses. A big part of the clan’s strategy is to dishonor key enemy characters to weaken them and dishonor their own characters to use powerful effects. 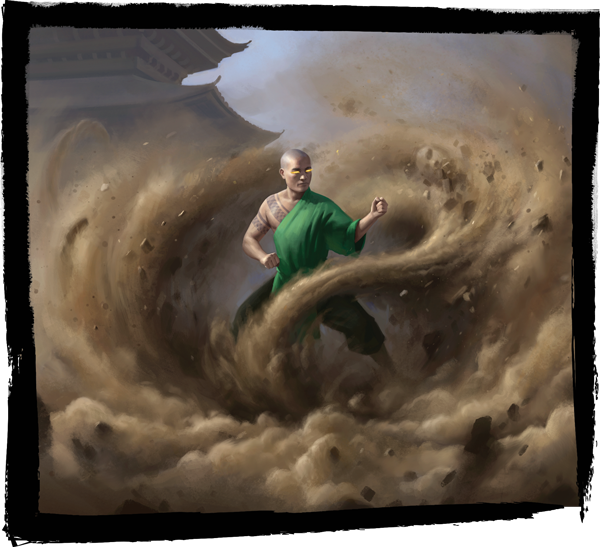 The primary game mechanic that allows players to fight against a dishonor-heavy strategy like Scorpion’s is to honor characters, whether by card effects or by resolving the fire ring. With Young Rumormonger on the table, the opponent cannot effectively honor the characters that they need to honor in order to fight against the Scorpion's primary strategy. 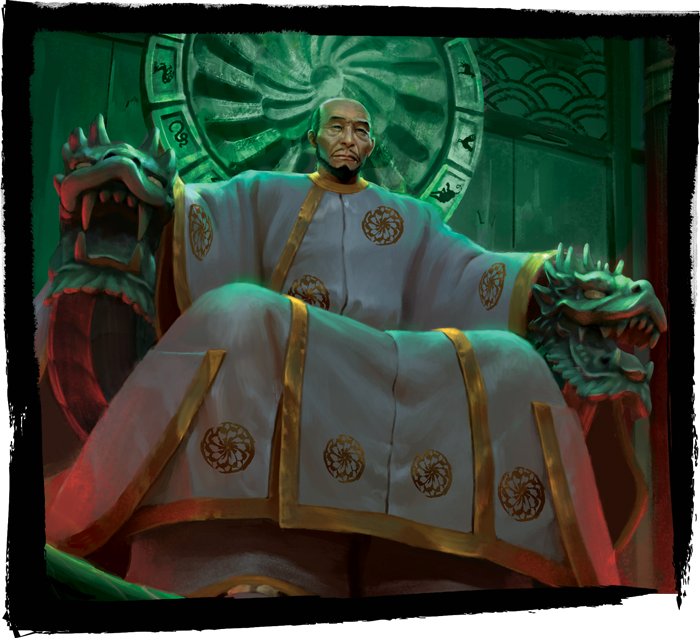 In addition, it allows Scorpion to dishonor their own characters with even less risk than normal, as they can ensure that their dishonor status tokens end up on the least relevant character at any given time. 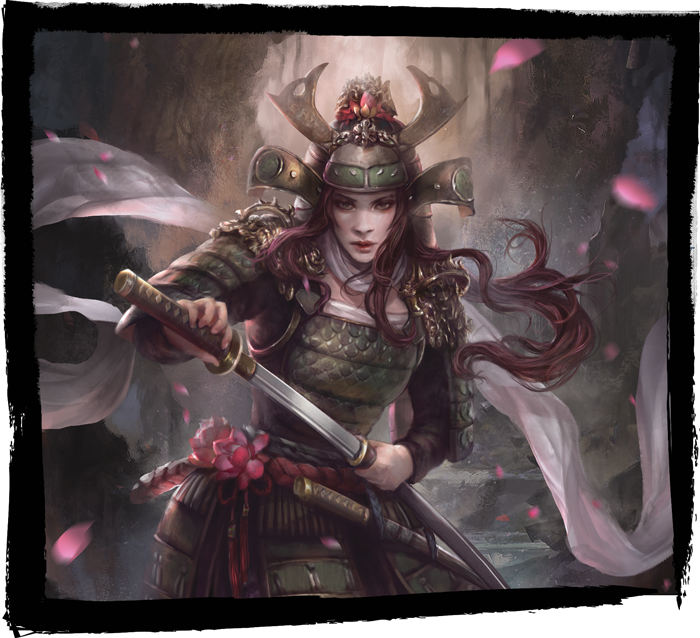 The sentiments of mono no aware run deep through all of Legend of the Five Rings: The Card Game, and the Rules Reference is a part of this. As a living document, the Rules Reference changes to reflect how the game and its players learn and grow. As developers, we use these changes to promote the game's long-term health, and I look forward to seeing how all of you respond to the most recent updates in the tournaments to come!